If you have a rental car, there are many interesting excursions within a one hour drive of Carcassonne. For driving directions, see our annotated Google map. No trip to the south of France is complete without a swim in warm Mediterranean waters. 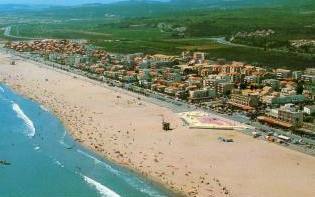 Narbonne Plage, only 35 min drive from Maison Juliette, offers miles broad sandy beaches. 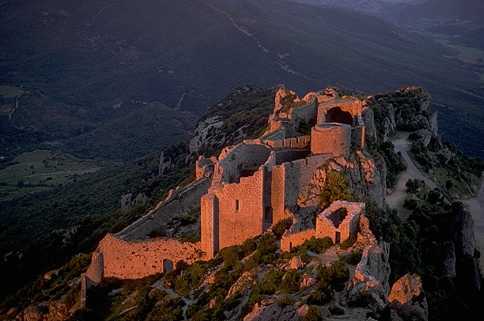 The Cathar castles are a series of fortresses built by the French king on the southern border of his lands during the 13th century. Many castles from these times remain – some, like the Cité de Carcassonne, have been completely and beautifully restored, while others like the Château de Peyrepertuse, are only partially restored. Within an easy drive of Carcassonne, you’ll find six castles to explore: Rennes le Chateau (featured in Dan Brown’s The Da Vinci Code), Peyrepertuse (our favorite), Queribus, Puilaurens, Aguilar, and Termes. 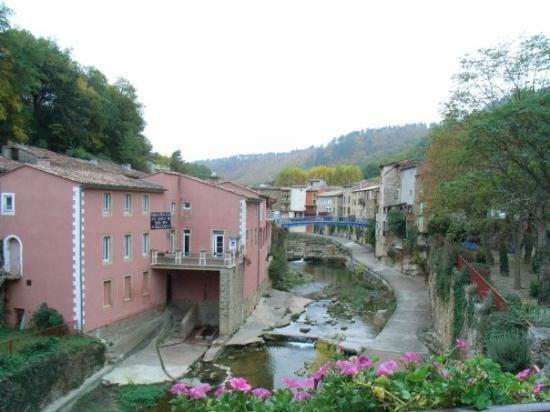 There is a wonderful natural hot springs in Rennes Les Bains, only 1 hour south of Carcassonne. Enjoy a dip in one of the two outdoor swimming pools, naturally heated to 104F (40C) and 114F (46C). 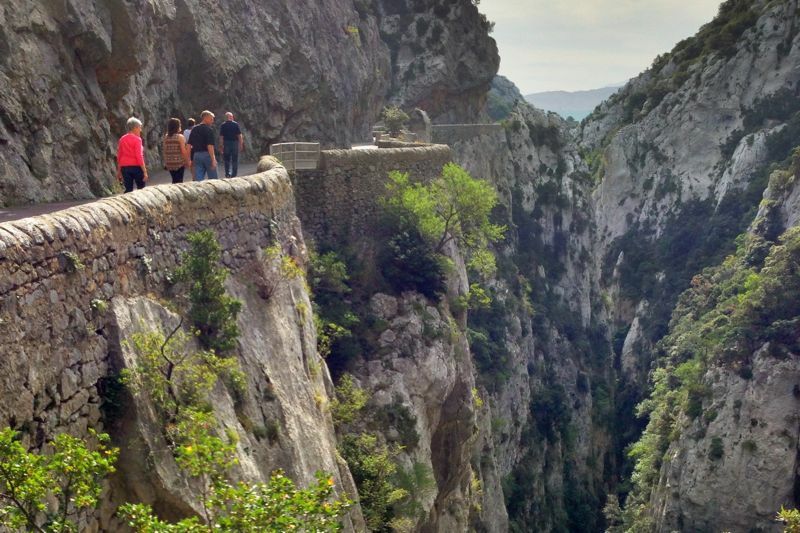 Just a few miles from Chateau de Peyrepertuse (our favorite Cathar castle), the Gorge du Galamus is a narrow corniche road that seems to defy gravity. Only rarely does one glimpse the river below running in a narrow ravine. It’s a beautiful drive but requires a confident driver since it’s narrower than most of the streets in the center of Carcassonne, with only occasional turnouts to support two-way traffic. Best seen on a weekday during the summer. Be sure to see the Hermitage de Saint-Antoine de Galamus, carved out of a rock cave in the 7th century and then developed in the 15th century. Le Moulin à Papier de Brousses is an artisan workshop demonstrating how paper was made in 17th and 18th centuries. Guided tours are in French, but they hand out a good explanation in English. Gift shop offers handmade paper in various forms. Two tours/day Mon-Fri, five tours/day on weekends. About 30 min north of Maison Juliette. Bring a picnic and eat lunch along the water wheel before the tour. 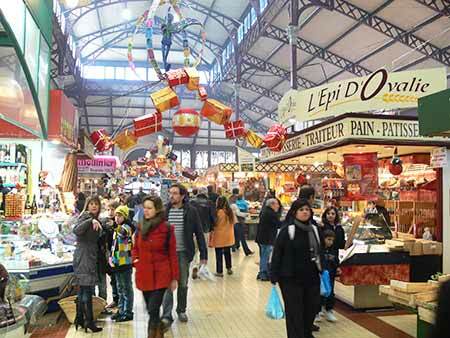 In central Narbonne, just a few miles from the nearest beach, there are wonderful outdoor markets selling food every day from 7am-1pm, and also clothes and gifts on Thursdays until 6pm. 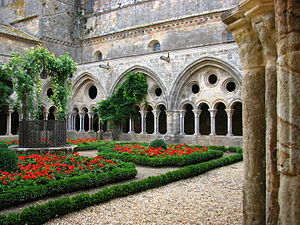 Just a few miles from Narbonne, you’ll find Abbey de Fontfroide, a beautiful 11th century Cisterian abbey, now privately owned but still open to the public for tours. Vin En Vacances offers one day wine tours of the area. They will pick you up at Maison Juliette in a minivan and drive you to several local vineyards. Fine Wine Tours also offers one day wine tours, departing from Maison Juliette. Languedoc Roussillon is honeycombed with over a dozen caves or grottos that are open to the general public. 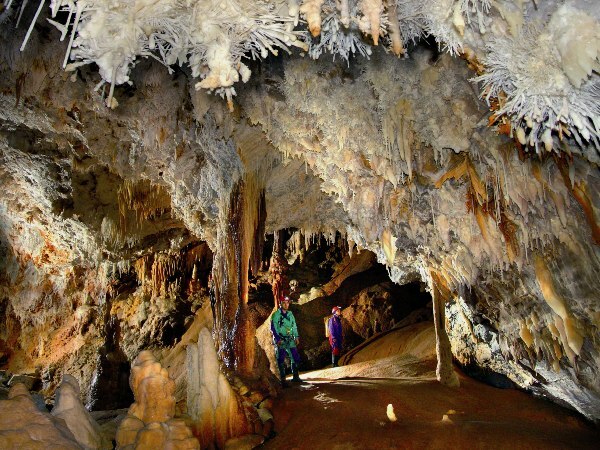 Each has their own unique points of geological interest and their own unique beauty – stalactites and stalagmites, enchanting rock formations, underground rivers and lakes, etc. Lascaux caves – prehistoric paintings from approx. 17,000BC. The original caves are now closed to the public, and a replica opened 200m from the original. Details on wikipedia. About 3 hour drive from Maison Juliette. 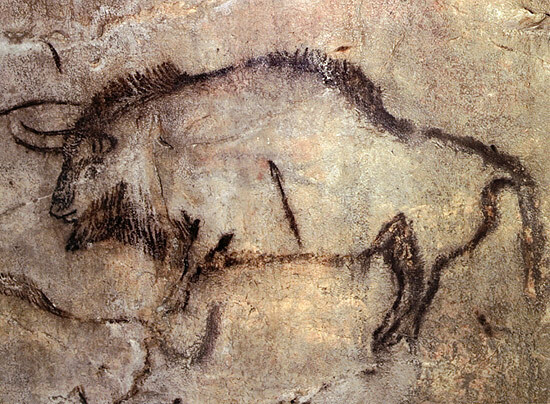 Grotte de Naiux – famous prehistoric cave paintings of bison, horses and ibex, from approx. 11,000BC. Details on wikipedia. Visits to the cave are limited; reservations recommended. About 1.5 hour drive from Maison Juliette. Giant Chasm of Cabrespine is one of the largest caves in the world open to the public – 260 ft (80 m) long and 720 ft (220 m) high. The geology of the cave is unusual, with a huge range of crystal and rock formations. About 30 min north of Maison Juliette. Grotte de Limousis is another large developed cave, located 30 min northeast of Carcassonne.